Refresh, reinvigorate, remake, restore, repair, refill and renew. Learn new skills, save money …and save your stuff from landfill!! Please do help us spread the word by sharing www.horshamrepaircafe.org.uk with friends, family, colleagues and your local community. We are keen to hear from volunteers with specific repair skills to offer and also to help out sometimes with refreshments etc. 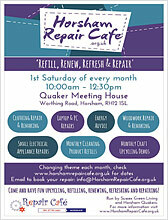 Please contact Jill Shuker on info@horshamrepaircafe.org.uk. Donations are invited for any repairs undertaken and refreshments. Children welcome as long as they are supervised. Booking recommended, please visit www.HorshamRepairCafe.org.uk. refilling, renewing, refreshing and repairing! 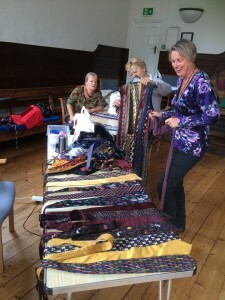 Sew it, make it, fill it – don’t throw it! Read the latest press release about the Horsham Repair Cafe here. 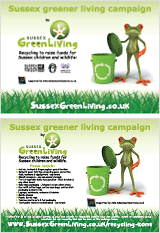 This entry was posted in Events, Green stats, facts & news, Recycling facts. Bookmark the permalink.